Children can practice their handwriting or have a go at a story centred around a bouquet of roses with this small collection of rose worksheets. There have been a few very famous poems written about the rose - and maybe this acrostic poem printable will encourage the next great rose poem! Choose from four versions. You could also use the printable as a writing frame. Children can learn to form the letters of the word ROSE with this pretty finger tracing worksheet. Practice writing the word "rose" with this pretty handwriting worksheet. Use it as part of a flower theme, for Mother's Day, Valentine's Day - even St George's Day! This pretty story paper provides just a few lines for writing on - not enough to be intimidating - and a rose to colour in. Perfect for love letters, poems and lots more writing projects! Whether it's for Valentine's Day, St George's Day or a flower theme, children can practise letter formation with our lovely rose word tracing. 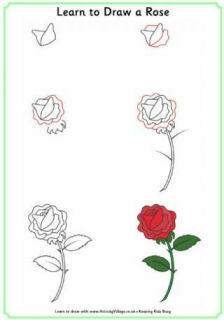 The coloured version of our rose writing page is illustrated with a red rose. You could use it for Valentine's Day, any special occasion, or perhaps even St George's Day writing projects. We have a black and white version too, on which the rose can be coloured in.